"God's Son" redirects here. For the Nas album, see God's Son (album). For the 2014 film, see Son of God (film). For other uses, see Son of God (disambiguation). The term "son of God" is sometimes used in the Old and New Testaments of the Christian Bible to refer to those with special relationships with God. In the Old Testament, angels, just and pious men, the descendants of Seth, and the kings of Israel are all called "sons of God." In the New Testament, Adam, and, most notably, Jesus Christ are called "son of God," while followers of Jesus are called, "sons of God." The term "Son of God" should not be confused with the term "God the Son" (Greek: Θεός ὁ υἱός), the second Person of the Trinity in Christian theology. The doctrine of the Trinity identifies Jesus as God the Son, identical in essence but distinct in person with regard to God the Father and God the Holy Spirit (the first and third Persons of the Trinity). 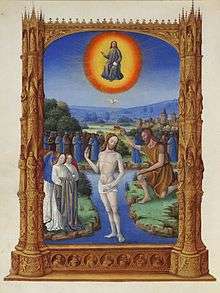 Nontrinitarian Christians accept the application to Jesus of the term "Son of God", which is found in the New Testament, but not the term "God the Son", which is not found there. Gabriel's Revelation, also called the Vision of Gabriel or the Jeselsohn Stone, is a three-foot-tall (one metre) stone tablet with 87 lines of Hebrew text written in ink, containing a collection of short prophecies written in the first person and dated to the late 1st century BCE. It is a tablet described as a "Dead Sea scroll in stone". In Christianity, the title Son of God refers to the status of Jesus as the divine son of God the Father. It derives from several uses in the New Testament and early Christian theology. The terms "son of God" and "son of the LORD" are found in several passages of the Old Testament as well, but generally do not refer to Jesus or the Trinity directly. She (Mary) said, "My Lord, how will I have a child when no man has touched me?" [The angel] said, "Such is Allah ; He creates what He wills. When He decrees a matter, He only says to it, 'Be,' and it is. 1 2 3 4 "Catholic Encyclopedia: Son of God". Retrieved 7 October 2014. ↑ "International Standard Bible Encyclopedia: Sons of God (New Testament)". BibleStudyTools.com. Retrieved 7 October 2014. ↑ Merriam-Webster's collegiate dictionary (10th ed.). (2001). Springfield, MA: Merriam-Webster. ↑ Boscaro, Adriana; Gatti, Franco; Raveri, Massimo, eds. (2003). Rethinking Japan: Social Sciences, Ideology and Thought. II. Japan Library Limited. p. 300. ISBN 0-904404-79-X. ↑ Britannica, Encyclopaedia. "Xiongnu". Xiongnu (people) article. Britannica. Retrieved 2014-04-25. ↑ Darian Peters (July 3, 2009). "The Life and Conquests of Genghis Khan". Humanities 360. 1 2 3 Jan Assmann (2003). The Mind of Egypt: History and Meaning in the Time of the Pharaohs. Harvard University Press. pp. 300–301. Retrieved 16 March 2014. ↑ "Catholic Encyclopedia". Retrieved 7 October 2014. ↑ Cartledge, Paul (2004). "Alexander the Great". History Today. 54: 1. ↑ "The First Jesus?". National Geographic. Retrieved 2010-08-05. 1 2 Yardeni, Ada (Jan–Feb 2008). "A new Dead Sea Scroll in Stone?". Biblical Archaeology Review. 34 (01). ↑ van Biema, David; Tim McGirk (2008-07-07). "Was Jesus' Resurrection a Sequel?". Time Magazine. Retrieved 2008-07-07. ↑ Ethan Bronner (2008-07-05). "Tablet ignites debate on messiah and resurrection". New York Times. Retrieved 2008-07-07. The tablet, probably found near the Dead Sea in Jordan according to some scholars who have studied it, is a rare example of a stone with ink writings from that era — in essence, a Dead Sea Scroll on stone. 1 2 3 4 5 6 7 Matthias Henze (2011). Hazon Gabriel. Society of Biblical Lit. Retrieved 2 April 2014. ↑ Michael S. Heiser (2001). "DEUTERONOMY 32:8 AND THE SONS OF GOD". Retrieved 30 January 2014. ↑ EDWARD M. COOK. "4Q246" (PDF). Bulletin for Biblical Research 5 (1995) 43-66 [© 1995 Institute for Biblical Research]. Retrieved 8 December 2014. ↑ David Flusser (2007). Judaism of the Second Temple Period: Qumran and Apocalypticism. Wm. B. Eerdmans Publishing. p. 249. Retrieved 8 February 2014. ↑ Jerome H. Neyrey (2009). The Gospel of John in Cultural and Rhetorical Perspective. Wm. B. Eerdmans Publishing. pp. 313–316. 1 2 3 Lepard, Brian D (2008). In The Glory of the Father: The Baha'i Faith and Christianity. Bahá'í Publishing Trust. pp. 74–75. ISBN 1-931847-34-7. 1 2 Taherzadeh, Adib (1977). The Revelation of Bahá'u'lláh, Volume 2: Adrianople 1863–68. Oxford, UK: George Ronald. p. 182. ISBN 0-85398-071-3. ↑ Hornby, Helen, ed. (1983). Lights of Guidance: A Bahá'í Reference File. New Delhi, India: Bahá'í Publishing Trust. p. 491. ISBN 81-85091-46-3.